Roadrunner … eat my Dust! Made famous by the Warner Brother cartoons, ‘Roadrunner’ is a quirky, intelligent desert survivor, and while Roadrunner always outsmarted Wile E. Coyote, real roadrunners are just as cunning and adaptable. We meet roadrunners in the desert, hunting for some of the most deadly creatures – scorpions, tarantulas and rattlesnakes.. goading a rattlesnake, catching its head mid-strike before smashing its vertebral column in six places.. or ripping the legs off the biggest tarantula, tossing the body in the air and swallowing it whole. Roadrunners are born to run, reaching 20 miles an hour, and love chasing or being chased. Using sonic equipment we listen to ‘roadrunner speak’ as a pair search for the local Cooper’s hawk, just for the thrill. They goad the hawk into chasing them, and they race around bushes and rocks to avoid being caught. Roadrunners are unfazed by humans, so we’ll get an intimate glimpse of roadrunner life, as a male courts his female with gifts of lizards. We’ll follow the pair as they attempt the daunting task of rearing eleven chicks in only three weeks during springtime. As the eggs hatch, both roadrunners continually check their hatchlings, moving them by the head like chess pieces, searching for the weak. With night-vision nest cameras, we reveal the dark side of roadrunner life: desert resources are scarce and in the middle of the night the runts are tossed in the air and swallowed whole – or fed to the fitter chicks. Roadrunners are very territorial. 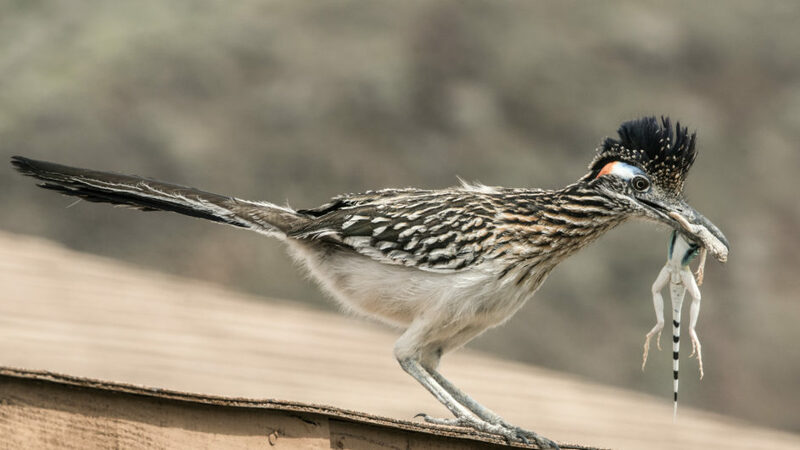 To see two unpaired birds come into contact, a scientist used a stuffed model roadrunner mounted with a hidden camera, pushing the model to the edge of a pair’s territory. It took 10 seconds for a pair of beaks and sharp claws to reduce the model to a ball of feathers – and trash the camera. Yet roadrunners do tolerate human neighbours – they thrive where the desert meets the suburbs, feeding off fledglings in the bushes, cockroaches in the bins and rats in the alleyways. Even the neighbourhood cat daren’t touch them but in only a matter of days, a roadrunner will become so tame it will take food from the hand. And this only seems to increase their popularity. Every Californian’s favourite cartoon character, ‘Roadrunner’ billboards scatter the desert highways, advertising couriers, restaurants, car sales. There’s still a lot we don’t know about this familiar bird and the more we learn, the more fascinating they become. Beep beep!